Epic landscapes, vast wilderness, Inuit culture, ice, the lowest density populated country in the world. The largest non-continental island, 80% covered with a permanent icecap, the coastal regions are covered with snow seasonally but were green enough in the summer months for Erik the Red to give it its name in the 10th century to encourage settlers. 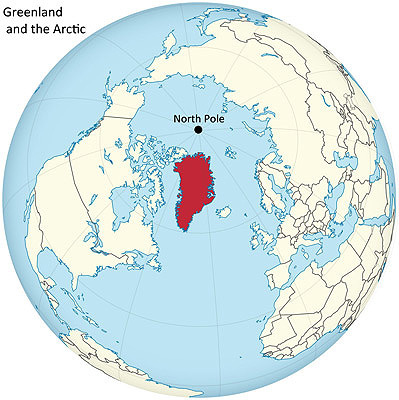 Greenland lies almost entirely in the Arctic Circle, it stretches to within 713km (443 miles) of the North Pole. Away from the great ice sheet, the land is often green and fertile, the growing season is short but crops are grown around the coast. There are no roads between towns, boat and plane with sled in the winter months are the means of transport. Greenland is a huge place covered with a huge icecap, if it all melted it would raise the level of the world's oceans by an estimated 7m (23 feet). Around the coastal strip in the summer however, it really does live up to the name, whereas other places in the Arctic can be barren and desolate, Greenland despite the huge icecap has a lot of plant growth, and that "coastal strip" is up to 100 km or more wide in places. It is all relative however, there aren't really any trees other than dwarf willow which at times can reach the lofty height of about a meter or so, though more often is found prostrate on the ground or growing closely against rocks to benefit from extra warmth in summer, having taken many decades do so. The island has been inhabited by different groups of people for over 4,500 years, though perhaps not continually. It is administered by Denmark and is moving towards independence though is still some way off. 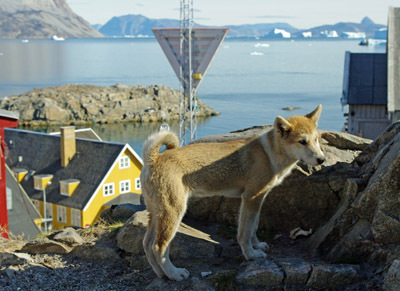 There is a rich Inuit culture in Greenland, sled dogs are common in many towns, especially smaller ones, you may even see a seal being butchered on the sea shore for food for both people and dogs. Most striking in the towns are the brightly coloured buildings, a style of architecture that started in the 1700's when pre-fabricated houses were shipped here from other Nordic countries. Houses are often placed on the top of small hills and rocks and sometimes it seems as much timber goes into the steps to get to them as into the actual house itself. There are no fences to mark property boundaries and no ugly tangles of overhead utility lines so giving a very clean and tidy, almost storybook appearance. Greenland can be reached year round by flights from Copenhagen, Denmark or Reykjavik, Iceland there are more flights to more destinations in the summer months. Visas are not needed for the nationals of the EU/EEA and many other countries to enter Denmark as a visitor for up to 90 days, use this to check. There are no sea ferries, though many cruise ship itineraries include Greenland in part or as a whole of the trip, see below. 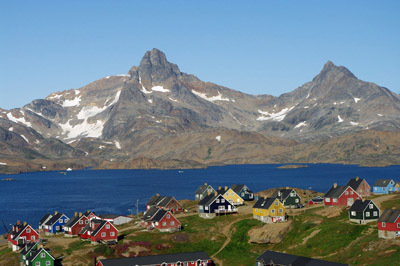 It is possible to engage in tourist activities in many of the settlements in Greenland and almost all will have some facilities. However, due to the relatively low and unpredictable numbers of tourists coming through, you cannot rely on being able to turn up and take part. The weather may dictate that activities are not possible, visibility and wind for helicopter trips, a lack of snow for dogsledding and snowmobiling for instance, or there may not be enough people to make the trip worthwhile for those running them. Wherever possible try to plan any such events in advance. There is very little agriculture in the Arctic (unsurprisingly), so most of the food has to be imported, fresh fruit and vegetables are particularly expensive as the distances are large, they are heavy, easily damaged and perishable. There is a hunting culture amongst the Inuit and active fisheries in many places. Eating what is locally available makes more sense here than in many places in the world. Freshly caught fish, whether from the sea or freshwater is an absolute must if it is available. The most delicious fish I have ever eaten was locally caught halibut in Greenland. 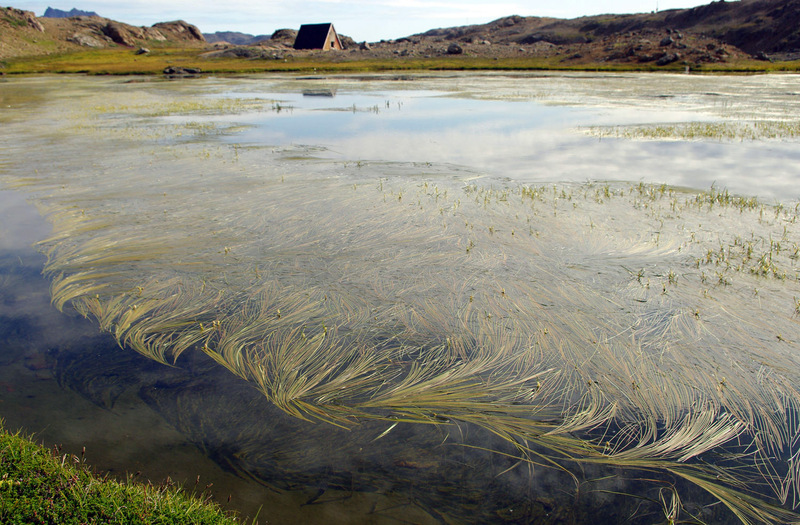 Greenland is an Arctic land and sea scape that is quite clearly Arctic, but maybe not quite in the way you imagined. In the summer it is brighter and far fresher than any natural/spring/pine advert you've ever seen. Away from towns, (not very far away from towns) you are out in the wilderness, there are no roads connecting towns here and so no other services to remind you of the presence of man either. Sightseeing on foot is an easy and rewarding thing to do. There is not the danger from polar bears in Greenland that there is in other places in the Arctic, though they have been seen around the village of Ittoqqortoormiit on the east coast in the summer months in recent years. 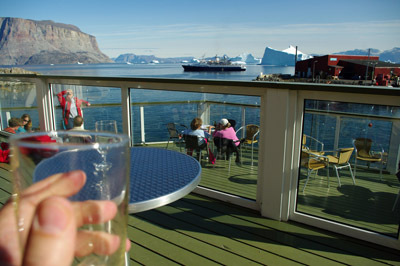 There are many activities characteristic of Greenland and the Arctic that can take place in many locations such as whale watching, bathing in hot springs (they are dotted around, not common but more so than most places), seeing the Aurora Borealis the northern lights, dog sledding and snowmobiling in the colder months with predictable snowfall, and viewing the many glaciers and countless icebergs in their constant variety. The Ilulissat Icefjord and Sermeq Kujalleq glacier near Ilulissat were admitted onto the UNESCO world heritage list in 2004, it is truly one of the wonders of the world. The glacier is the most productive in the northern hemisphere it calves around 40 cubic kilometers of ice every year into the narrow fjord in front of it discharging enormous icebergs on a daily basis, these then float out into Disco (or Disko) Bay. 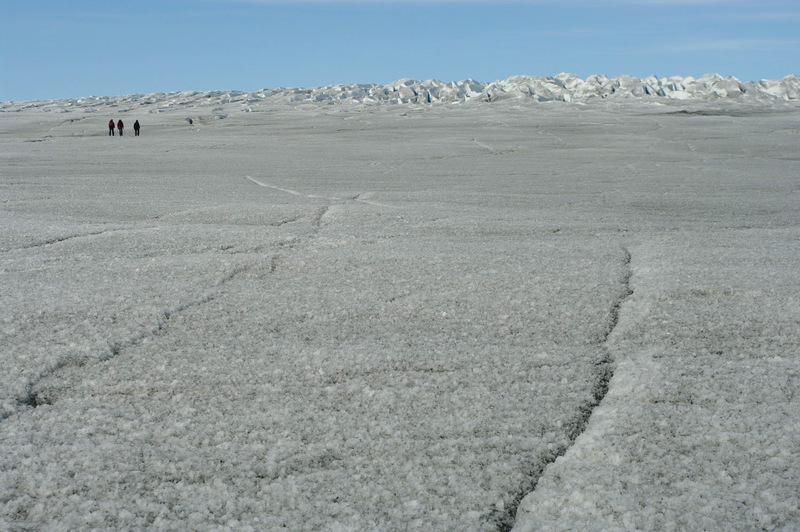 10% of all the ice that flows off the Greenland ice sheets comes down the Sermeq Kujalleq glacier, the world's fastest moving at 40m per day. 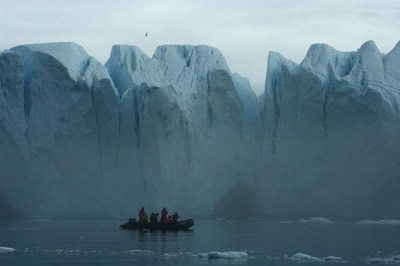 You can view the icebergs from boats and sea level, from the land or even from the air. 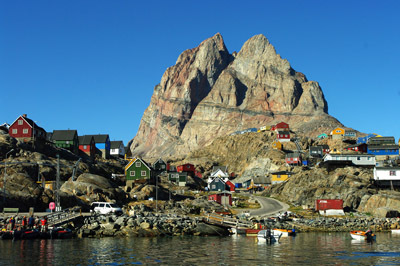 The capital of Greenland and largest town with a population of just over 16,000 which is close to a quarter of the population of the whole country. There are a number of museums here which are well worth visiting for the historical and cultural artifacts including mummies that were found in 1972. There is historic and contemporary art on display here, including live performances. 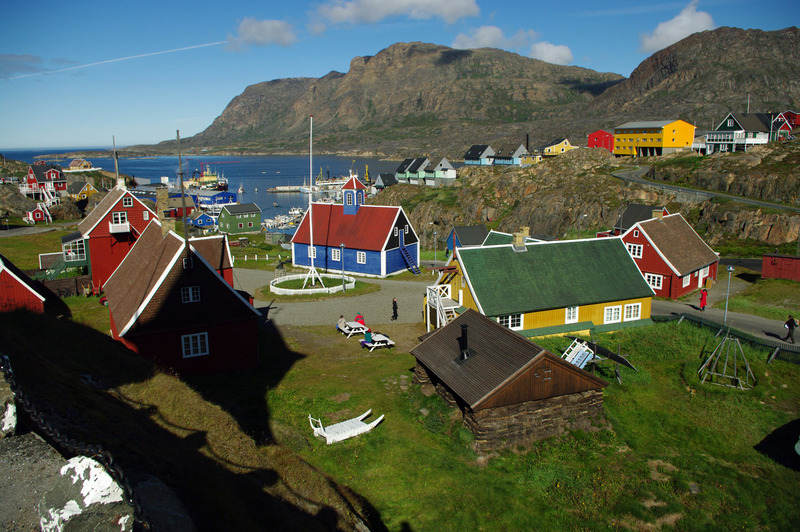 Nuuk attracts many tourists and is often the start or end point for cruises, as might be expected there are many activities that are therefore available for the cruise or independent tourist including whale watching, sailing, hiking, skiing, fishing, kayaking and more. The largest community on the east coast of Greenland with a population of just over 2,000. It is a particularly attractive town with a stream flowing through the middle of it which attracts local fishermen in the summer months where the stream meets the sea. Following the stream inland, you come to the "Valley of the flowers" which lives up to its name in a more convincing way that you might imagine for the Arctic. There is plenty of scope for walks in the surrounding hills and mountains from town, there are also a variety of bookable excursions though many are subject to minimum numbers and won't run if there aren't enough takers, even in high season. The northernmost town in Greenland, a small community of around 650 people plus some surrounding villages. 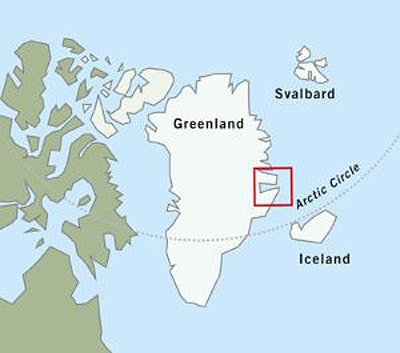 The settlement dates from 1953 when the people were relocated from the location of the newly built US Thule Airbase. The dogsledding season lasts longer here than anywhere else in Greenland thanks to snow cover and sea-ice persisting beyond the winter and well into the spring months. 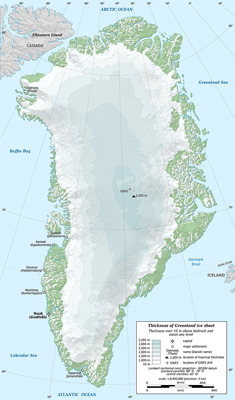 The Greenland icecap can be seen from many places around the coast, though is generally held in place by hills and mountains. It does come down to the coast in a number of places, fewer and further between than you might imagine. The coastal strip of ice free land is also 100km or more wide in places and so the icecap is often far inland from the coast or the town where you might happen to be. If you wish to visit the icecap it will probably require some planning and effort. 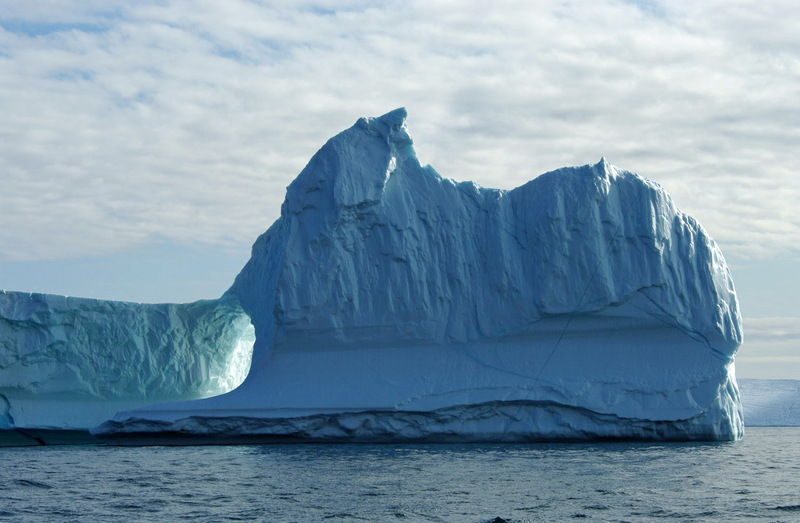 If you are close-by to one of the access points a day trip is viable, there is a boat trip out from Tasiilaq for instance where you can walk on the icecap and see it stretch endlessly upwards and to the horizon. There are helicopter trips that will fly over and possibly land on the icecap, these are subject to weather and the number of passengers as to whether they run or not. 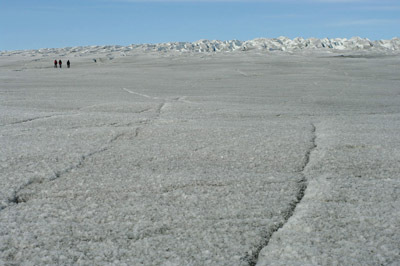 You can take part in trips to the icecap spending a night or longer camping out on it. If you are very keen, fit and have appropriate experience it is possible to ski across it pulling sledges and camping as you go in around 30 days. A town on the west coast of Greenland situated in a fjord of the same name, the town of around 1300 people is located on an island in the fjord with an impressive and imposing mountain rising up behind it to 1170m. Uummannaq mountain is frequently described as "heart shaped" though the description seems somewhat fanciful to me, it is nonetheless very impressive and almost ridiculously picturesque. Also notable for getting around 2000 hours of sunshine a year. The largest commercial airport in Greenland lies at the end of a spectacular 170km fjord on the west coast. It is the site of what was originally a US air force base so accounting for what would otherwise be a rather odd place to put the main international airport. 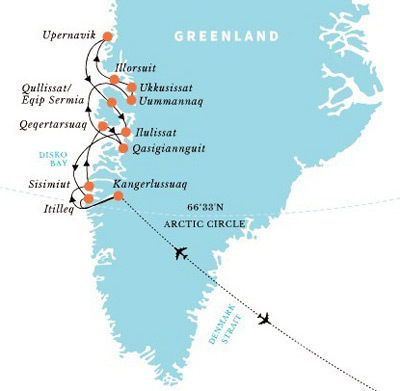 Many visitors arrive or leave Greenland by air at Kangerlussuaq either to Europe or North America, cruise ships may begin or end their journey here too, the long fjord is very beautiful though sometimes the journey down is partially at night due to the itinerary. The town has around 500 people who mainly work in jobs connected with the airport or tourism. The town is something of a travel hub for access to the icecap, it is possible to gain access fairly easily after a drive of about an hour. There are also extensive ice free upland areas within a short reach. The town itself is functional rather than pretty. the actual routes available and durations vary somewhat from season to season, many trips can happen in either direction. Fly to and from Kangerlussuaq at the end of an 190km long fjord to join a ship, 8 - 12 day trips visiting glaciers, icebergs and experiencing Inuit culture. 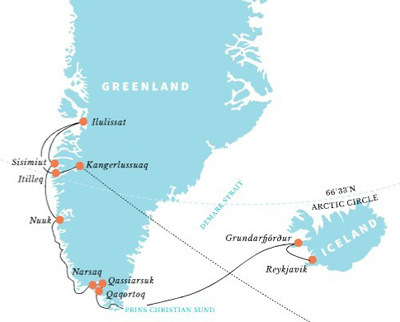 A Longer trip of 13 days join a ship at Reykjavik and combining Iceland with the southern fjords of Greenland and the UNESCO World Site of Ilulissat Isfjord on the west coast flying back to Copenhagen. 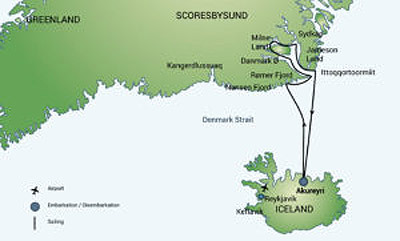 3 islands trip, 13-17 days, Svalbard, Greenland and Iceland, itineraries and time at each island vary. 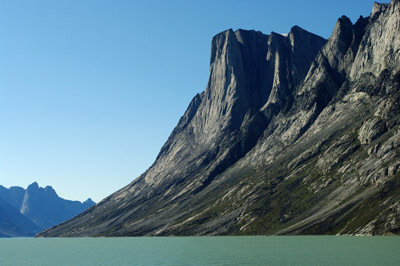 High Arctic cruise of 13 - 24 days, west coast of Greenland and Canadian islands, history, wilderness and culture. 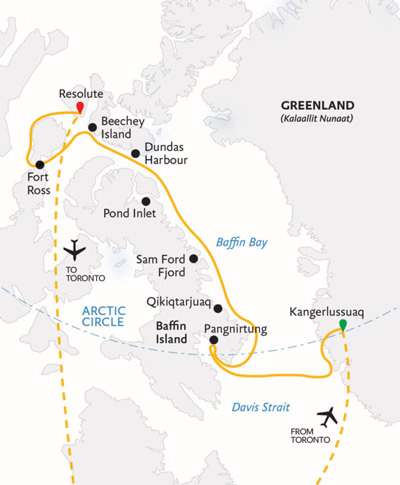 There are also trips that complete the Northwest Passage in full or part, some reaching as far as Alaska. A semi-circumnavigation in an icebreaker, 21 days, along the north and down the west coast if ice conditions allow or down the east coast if not. 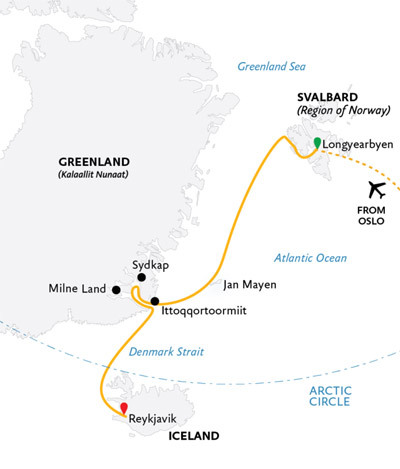 Fly from Iceland to Greenland's east coast where you join the ship, fly both ways or sail one and fly the other, 8 - 13 days, a good cruise to combine with a land-based visit to Iceland.